I've been wanting to make a tres leches cake ever since my first taste of one about four years ago. So, I did a little search on the internet the other day. 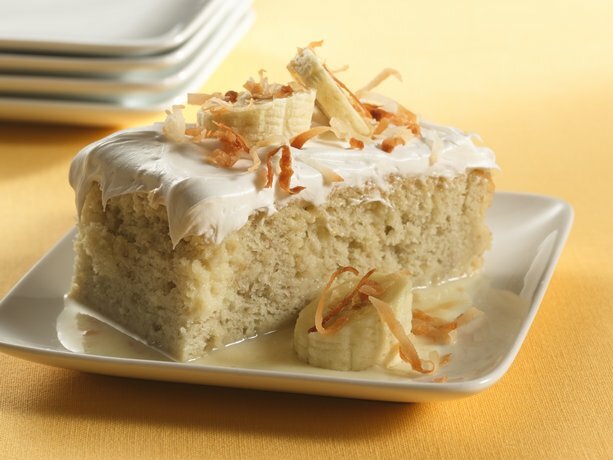 Betty Crocker has a tres leches cake recipe, and then I found their banana tres leches cake. Me, lover of all things banana, could not look back. So how'd it turn out? My husband complained that I only gave him one piece. Kade said, "MMMmmmmm." And Kip told me, "This is the best cake ever!" No lie. In large bowl, beat cake mix, water, oil, eggs and mashed bananas with electric mixer on low speed 30 seconds; beat on medium speed 2 minutes, scraping bowl occasionally. Pour into pan. Poke top of cake every 1/2 inch with long-tined fork, wiping fork occasionally to reduce sticking. In large bowl, stir together condensed milk, coconut milk and whipping cream. Carefully pour evenly over top of cake. Cover; refrigerate at least 2 hours or overnight until mixture is absorbed into cake. Spread frosting over cake. Garnish each serving with banana slices and/or toasted coconut, if desired. Store covered in refrigerator.